Exchanging contact information electronically—via e-mail or even using apps like Bump—may be the way of the future, but some still prefer an actual physical object. For those people, Chronos has released SOHO Business Cards 3, a major upgrade to its business card creation app for the Mac. A key feature of this upgrade is Smart Templates, which is essentially an intelligent template system that makes it easier to lay out your card. Double-click a paper area of the card, for example, and SOHO Business Cards 3 will display your paper options. But double-click a logo area, and you’ll receive a different set of graphics tools and options. Chronos included over 70 Smart Templates for the feature’s debut. A new Cover Flow browser brings some style to sifting through card and paper templates, while a new Font Preview window displays your text in the actual fonts you’re trying to chose from. 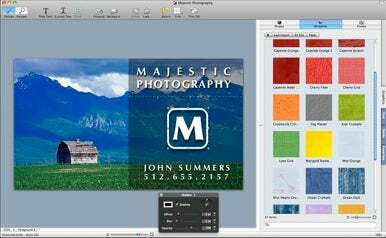 Other new features include support for Mac OS X’s Paste and Match Style option, six new Smart Shapes, 974 more template graphics, and a handful of new card-editing tools. SOHO Business Cards 3 is available now for Mac OS X 10.5.8 or later. A free demo is available, while new licenses cost $40 and upgrades for 1.x and 2.x users cost $25.